KINGSTON: Evin Lewis once again turned out to be India’s nemesis in the shortest format with yet another magnificent hundred in West Indies’ comfortable nine wicket victory against India in the one-off T20 on Sunday. Chasing a competitive target of 191, Lewis smashed his way to an unbeaten 125 off 62 balls with as many as 12 sixes and six fours as the reigning World T20 champions knocked off the runs in only 18.3 overs. It turned out to be a forgettable day for the bowling unit after a sub-par total on a batting belter as Lewis notched up the highest individual score by a West Indies batsman surpassing Chris Gayle. Lewis had earlier tormented the Indian bowlers with a 49-ball 100 during a T20 International in Florida, last year. In fact, Lewis turned Gayle into spectator with his power-hitting as he cleared the front-leg to hit in the arc between long-off and long-on. 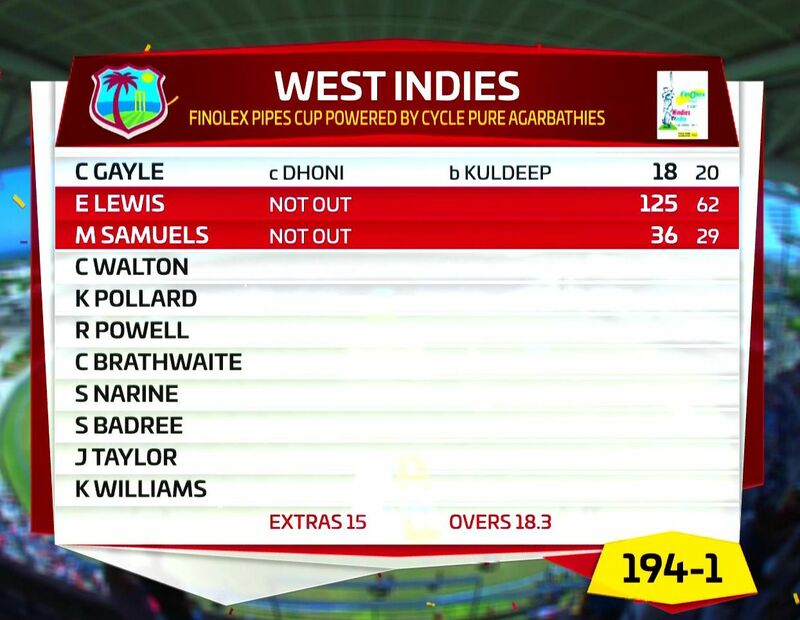 Gayle’s contribution in the opening stand of 82 was a mere 18 off 19 balls. On a true pitch, the Trinidad left-hander just hit through the line clearing the ropes at will. He got a couple of reprieves with Mohammed Shami and Dinesh Karthik being the offenders but one can’t take anything away from Lewis. The experienced spin duo of Ravindra Jadeja (5 sixes), Ravichandran Ashwin (4 sixes) conceded nine sixes between them while Mohammed Shami (0/46 in 3 overs) was hit for six boundaries and two sixes. Experienced Marlon Samuels (36 no off 29 balls) played second fiddle during the 112-run stand as Lewis fittingly finished the match with a six off Jadeja. Earlier, Indian batsmen faltered badly after a rollicking start provided by their openers scoring 190 for 6 after being put into bat. Skipper Kohli (39 off 22 balls) and Shikhar Dhawan (23 off 12 balls) added 64 in a whirlwind opening stand using the Powerplay overs to the fullest. 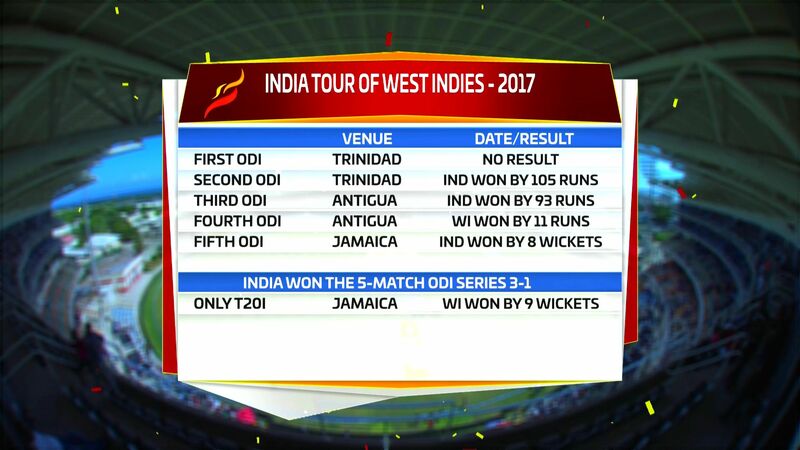 However, Dinesh Karthik (48 off 29 balls) and Rishabh Pant (38 off 35 balls) could not keep the momentum despite an 86-run stand in 9.5 overs. As a result, India could manage only 97 runs in the their back 10 after scoring 93 in the first largely due to positive intent showed by the Dhawan-Kohli duo. 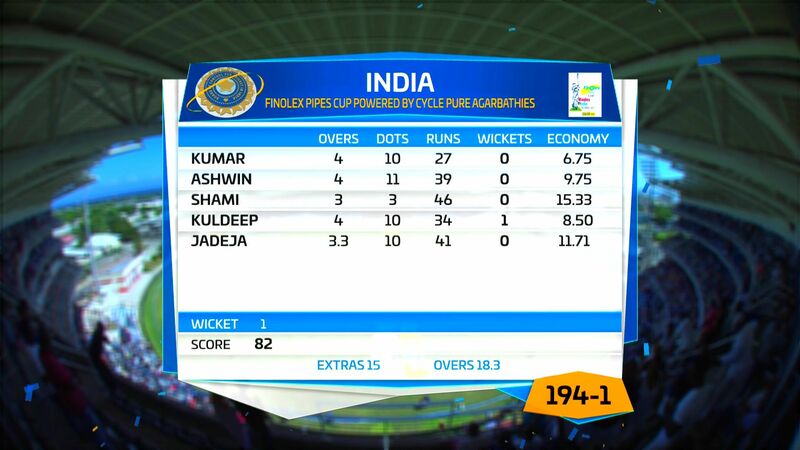 The total was atleast 20 runs short of par-score on a good batting surface. Kohli was in regal form as he punished each and every bowler hitting seven boundaries and a six during his short stay. A backfoot cover drive off Carlos Brathwaite and a six over long-on off Kesrick Williams stood out among the rest. Anything on his pads was treated with disdain. Dhawan was also in imperious form hitting Samuel Badree for a couple of boundaries in his opening over. He hit three more boundaries as India looked set for a big total. However, Kohli trying to repeat a shot off Williams couldn’t clear mid-on. New man Pant was responsible for a poor call running Dhawan out. 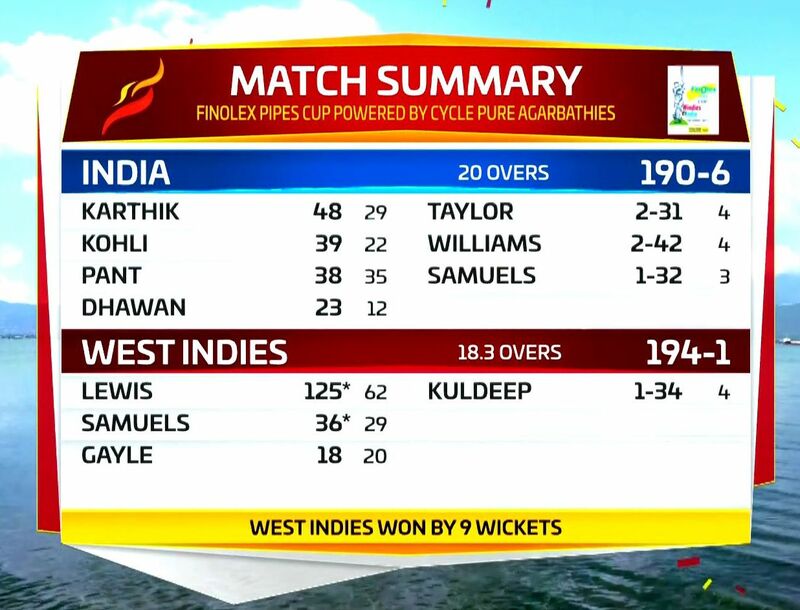 However once Pant and Karthik joined forces, the run-rate dipped badly. Especially young Pant, touted as the ‘Next Big Thing’ in Indian cricket was completely out of sorts. The only shot he timed well was a six over long-on off Marlon Samuels followed by a boundary over extra cover.